When does a game hit a little too close to home? When does it make your heart ache? When do you feel almost a little too happy to take your revenge out on imaginary characters? Those were the questions I asked myself as I played Ubisoft’s Assassin’s Creed: Freedom Cry, a DLC/Standalone companion to Assassin’s Creed IV: Black Flag. Freedom Cry had been in my backlog for a couple of years. It is actually the first game in the series that I have completed. I own Assassin’s Creed III on PS3 and ACIII: Liberation for the Vita, with a couple of hours in on each, but they each got put aside. After playing through Metal Gear Solid V: Ground Zeroes (which I will write about once I pick up The Phantom Pain in the near future), I jumped back into my PS3 library and gave Freedom Cry a shot. 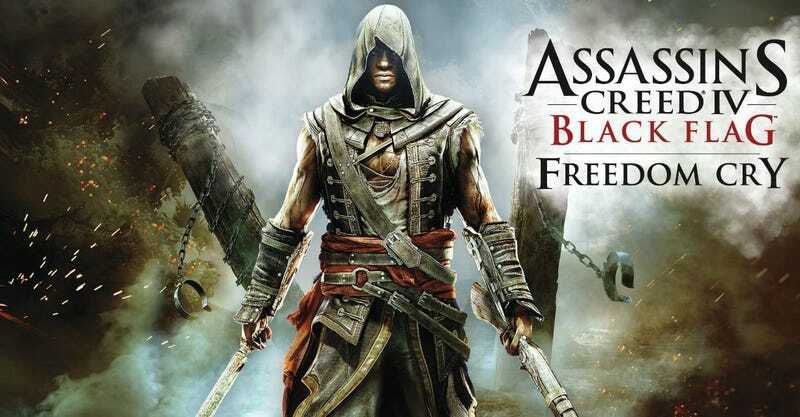 In Freedom Cry, you are Adewale, once a runaway slave who has both a pirate and a member of the assassin’s order. He was introduced in Black Flag and is now in the midst of his own adventure after his ship wrecks near the shores of Saint-Domingue, of what is now Haiti. In Port-au-Prince, Adewale encounters the brutality that he once faced as a child, of his people in chains being sold, beaten, and sometimes murdered. Long story short, as with others games in the series there is intrigue and drama with Templars and backroom dealings, and Adewale finds hesitatingly in middle of it. After forming an uneasy alliance with a local madame named Bastienne Josephe, he ultimately decides to stay and fight for the oppressed, taking freedom by any means necessary. Having all of this in play makes this game intriguing. Gameplay involves both mission based and open-ended gameplay. Missions include tracking subjects, eavesdropping for information, stealing items, and outright assassination. The world of Assassin’s Creed takes place in a simulation, with a person in the modern day inhabiting the role of ancestors.. In Freedom Cry, that is downplayed, with the only acknowledgment that it is a program is through loading screens where you can make Adewale run around in a blue, floaty netherworld, and when you fail a mission or die and the game bluntly tells you that you have de-synchronized from the program. Graphically, the game is impressive. I wondered if I was going to be jaded going back to my old PS3 library after having spent most of the year playing PS4 games. I was not disappointed. Ubisoft did their research and presented what appeared to be a realistic representation of old Haiti/Saint-Domingue. One of my favorite parts of the game is sailing the seas and being a pirate. Ship battles are exhilarating in Freedom Cry. Sailing the Experto Crede, you have to strategize your plan of attack. You can be somewhat stealthy, hitting ships from a distance with mortars, or you can go in with brute force and a relentless volley of firepower. You can elect to sink ships or disable them enough to be able to board them and dispatch its crew and steal its resources. Other objectives might include destroying gunpowder stores or scaling the masts and destroying the enemy flag. Storms can brew up as well and foil your attempts by tossing your ship to and fro in massive swells. Occasionally a slave ship will be on the seas, escorted by three ships. If you can take them out you can free the slaves on board. If you build up notoriety, hunter ships will come after you and soon you might find yourself surrounded by ships looking to take you down. I found out that doing so before upgrading your ship will not end well, but once it was done I handled myself fairly well. You sail from island to island searching for treasure and plantations to liberate. Shipwrecks can be discovered and you can submerge within a diving bell and explore the depths. If you need a distraction, you can attempt to harpoon hammerhead sharks, killer whales, and great white sharks for their resources. It becomes a fun mini-game if you are not opposed to a bloody spearing of sea dwellers. I enjoyed for what it was. It is the life of a pirate, no? Plantations are abound in Port-Au-Prince and the surrounding islands. You have the abilty to go onto each one and attempt to save the captive slaves. Stealth is an imperative. If you are caught, the overseers will ring a bell and alert the others, who will begin killing the dissenting slaves. You have to dispatch upwards of twenty enemies on these missions. As you work your way around the plantation you will find groups of slaves huddled up in buidlings or in the bushes behind them. You can try to usher them out quietly, ask them to stay put while you do your work, or use them to help overtake the overseers. This is a risky option but it can prove useful. Saving as many lives as you can has other purposes: not only does saving slaves open up unlocks for better weapons, but when you save Maroons, former and escaped slaves who have formed a resistance group, they will join your pirate crew. They are led by your second in command, Augustin. I appreciated the assassin’s bag of tricks. Besides lying in wait in the bushes to ruthlessly eviscerate enemies with the series’ trademark hidden wrist blades, you have the option of using sleep darts and (one of my favorites) berserk darts, which put the victim into a rage and they attack their allies forcing them to kill or be killed. Rope darts can be used to pull enemies towards you for the kill, or you can use to yank snipers off rooftops or if you have the leverage, use the ropes to hang them. Machetes and axes chop away with a fury. Useful tools like smoke bombs give you an advantage, and when all else fails you can use a blunderbuss or a stolen rifle and blow attackers away. Adewale has an impressive arsenal of moves to take down his enemies including vicious double assasinations. At times, movement is a little too sticky, and I found myself clinging to the side of a building rather than scaling it. But it was not frustrating enough to be discouraging. Another part of the game that was a bit lacking was in the breadth of options for upgrading and what to spend your currency, Real, on. Because of my frequent pirating and rescuing slaves, I accumulated a fairly large amount of currency, utlimately completely upgrading Adewale’s inventory and ship and still finishing with around 75,000 R, with small amounts going towards replenishing items. That could just be the limitations of a DLC campaign, but I found myself wanting a bit more. Now to the questions I posed at the beginning of this post. The history of slavery in Haiti goes deep, having existed in one way or another for over five hundred years. Freedom Cry shows us the side that is very familiar to those aware of the history of slavery on our shores in the United States, of Africans forcibly removed from their homes, packed on squalid ships and brought to the Americas to be chained and sold to the highest bidder. The stain of that still lingers. That is a part of my history. My DNA traces back to the western coast and central regions of Africa, and I have seen the ledgers of some of my ancestors’ arrival in South Carolina. It was a sobering moment to see their names listed as someone’s property along with the tables and chairs. So when Adewale walked through the streets of Port-Au-Prince and witnessed men in cages, or up on a platform to be sold like animals, I began to feel the pain and anger the character feels. I was shocked when the objective popped up to help the slave being chased before he is killed by a slaveowner. Like Adewale, I could not stand by and let these atrocities play out in front of me without doing something about it. I give Ubisoft and their multi-cultural team credit for taking on a difficult topic and not sugar-coasting how horrific it was truly was. Making a game like this can open up a big can of controversy if not handled in a certain way. During my time in the game, I found that I fell into a mode where I felt like I had to save everyone. I rooted out injured slaves and carried them to safe zones. I mercilessly killed scores of slavers to free men from chains. I dove headlong into crowds of enemies even when stealth was probably the best method, but I relished watching Adewale take down man after man, or sinking ship after ship. In Freedom Cry, I did not care to use my stealth to avoid confrontation. If I used it, was with the satisfaction that I was going to do something in violent retribution for the sins that these men committed. There were not specific targets: every red dot on my mini-map was someone that had to pay. It was if I was playing a version of Django Unchained except the hero wears an assassin’s hood and can leap from buildings and amongst the trees with ease. But for every plantation owner taken down, others will eventually come and take their place. The question is asked: is it worth it to rock the boat and cause a rebellion? Augustin and Bastienne are unsure, because it could mean the deaths of many in retribution. Towards the end of the storyline, you have to track down a slave ship that is being attacked. The ship was ordered sunk by the local governor, Pierre de Fayet, because of the interference by Adewale and the Maroons in his affairs. After racing to the ships location and sinking the attacking ships, you find that the slave ship is sinking. Adewale has to dive into the water and swim into the bowels of the ship and save as many of the slaves as possible. There you find dozens of men, chained together on their backs in close proximity, in rows on top of wooden structures. I think: This isn’t real. This isn’t real. As water pours into the ship and fires break out, Adewale has a decision to make: how many can I save? You have to break as many of the locks as you can, unshackling the men and allowing them a chance to survive. This is done via quicktime events, and if you miss a step it delays their chance of survival. You do this as you hear the scream of grown men who do not want to die like this. They begin burning and drowning, and ultimately you are forced to flee in order to survive. you crawl through the upturned ship and it is being swallowed by the sea. Slaves that are still alive dangle by their chains, begging you to help them but you cannot. Adewale continues to climb. You see the bodies of drowned slaves floating in the sea as you escape the lost ship and make your way to the surface. Survivor’s guilt takes hold: you cannot save everyone. You watch Adewale’s anger boil over. I realized mine has done the same. He no longer cares about upsetting the order of things. The man responsible for the subjugation of a people, de Fayet, is within his reach. Justice sometimes requires sacrifice. The final mission is to locate de Fayet at the governor’s mansion and chase him down and assassinate him, with every slaver and lackey out to stop you. The ironic thing is that I found this to be one of the easiest missions in the game. Eavesdropping and tracking were challenging, and it was far tougher to clear out a plantation without the bells being rung or take on three slave ship escorts than to take out the governor. I sprinted through town, shoving enemies out of my way. Occasionally I would be tackled from behind, but quickly recover and head for the rooftops or drop down and swoop through alleyways until I was near the beach. I sped through a small army and jumped forward, and Adewale drove his blades into de Fayet’s back. In a cutscene. Adewale slowly slices de Fayet’s belly open. I cringe but I feel the satisfaction of comeuppance being delivered. De Fayat defiantly states that slaves will not know how to handle themselves without the guidance of the overseers, and that the slaves are not even human. Adewale ends his life. Do I recommend Freedom Cry? Absolutely. It is a nice standalone title that has a lot going for it even with the horrific history that it is based on, and will encourage me to go back and work on some of the other titles (I know there are many) in the series. If you stick with the storyline it might take a few hours at best to get through it. I added on a few hours by doing extra missions and enjoying battles on the the sea. I looked back on my bloody rampage through Port-Au-Prince and on the open seas as the lenghty credits ran and the wonderful soundtrack of Haitian-inspired music. I was a few hours into the game when I caught myself putting the storyline in the background and spending hours pirating and liberating everywhere that I could. I did not expect a piece of DLC, Freedom Cry, to draw me in and make me think so much about my ancestors history and how the sins of the past simmer so deeply and linger and ache like a dark bruise. My DNA was constructed over time through their pain and survival. No matter how much blood was spilled, it was not going to make that pain go away. Would I have racked up the same kind of body count if it had been one of the other Assassin’s Creed entries? Maybe. Maybe not. But I fear the answer is clear.